Now that I have a seat, I’m restless. It’s March, and far from feeling like winter. I settle into my cushion bench seat and look around the room. This is still the only place to sit. I reach for my writing bag when my for-here mug of Columbian coffee is brought to my table restaurant style. What unexpected service. Coffee shops are usually more self-serve. I already know I’ll be back. Time to look busy. First thing, set up the tablet. While it boots, I’ll look even more productive with my Happy Planner calendar on the table. It has my blog schedule in it. Next, my yellow notepad, a few colored pens and voila! I’m all set to do work. I don’t feel productive. I feel cluttered. I’m restless. I always carry a few distractions in my workbag. 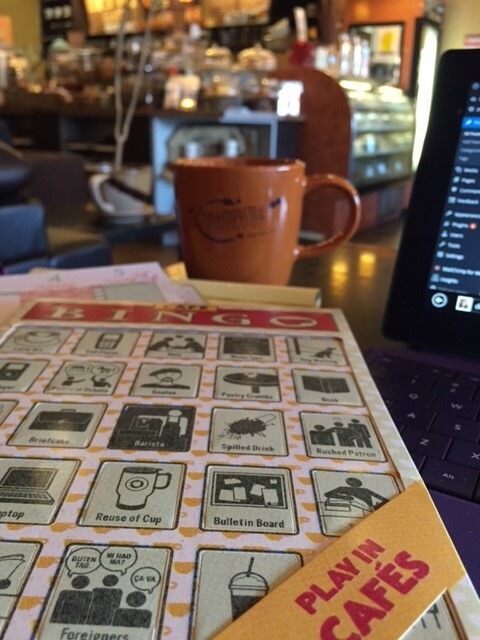 The item I’m craving to use is my Café Bingo game. It was a gift from my writerly friend, Kelly, who said, “I thought of you instantly when I saw it.” Yep, she got me right. The idea is to Bingo with coffee shop stereotypes. There are 12 cards, but I can play by myself. I wonder: can I cover the entire board, or at least get a bingo? There’s 0nly one way to find out. These cards are reusable. Cool! I wasn’t sure how that worked. When I read “pushing back” the squares on the package, visions of pieces popping off onto the table, never to be replaced again filled my head. With this, you fold the cardstock squares back while playing and then refold them when you’re done. I’m set to play with only one rule: I can’t count myself in any of the squares. That’s the center square and a gimme. Who carries these anymore? I amend that to seeing a cell phone with headphones. I see a hipster guy plugged in over in the comfy chair corner. Sure enough, there’s an older man in a comfy leather lounge chair in the corner. He’s reading a real newspaper, buried beneath an umbrella of inky pages. Uhhh…yeah. Who doesn’t come to a coffee shop without a laptop? You have to look hip and trendy and productive. Okay, I’m two for three right now, but my Surface has a detachable keyboard, so it would count for that square, if I included myself, which I’m not. I’m still hipster-ette. There’s a guy in business clothes–a suit, maybe–with a speckled tan bag next to him. I can’t see it exactly because it’s sitting on the floor and I don’t have a clear shot. I count it. I wouldn’t expect to see one of those hardcover square boxes with a latch and handle, and I’m surprised I think that. Remember, I can’t count myself. A lot of people have for-here mugs on their tables. Some people don’t. What a waste. Unless it’s tea. Tea almost always needs a disposable cup. I’m not sure how to count this. The square shows two stick figures holding hands with a heart between them. It’s just past lunchtime, so there are no caffeine kisses here. There are lots of people sitting together in twos, and I’m sure someone is on some kind of date. Meeting a friend for lunch, I count that. I don’t see ice cubes anywhere, nor a dome lid cup sitting on any table. Straight ahead there’s a woman with what looks like an icy blended drink. It’s a shade color different than the store’s cardboard cups, but that’s good enough for me. This is a local coffee shop. Of course, there’s one. Heck, even Starbucks has them. The Fine Grind has theirs on the back wall between the bathrooms. I saw that the first time I was here, but I found it awkward to peruse while people pee nearby. I didn’t expect to see this, but within five minutes of pulling out this game, a patron sloshes something on the floor. It looks like water, but I feel rude staring at him. There are no poster-board graphs or carpet swatches anywhere in here. There’s no table of suits. There’s no cluster of notepad papers. I bet some of these couples are in some sort of business meeting. I glance at Briefcase Guy and wonder, can I count him twice? There’s one person walking deliberately to the door, so I count him. He’s walking with a purpose not trudging along. Now even the game is making me restless and bored. I don’t think I can find the rest of the squares right now. I can’t see outside the door, so I’m not sure there’s a Dog Waiting, another game square. This coffee shop is smooshed in a strip mall, not stretched on a quaint, tree-lined street among boutique stores, so I doubt I’d ever find one. The woman at the high-top table against the wall, she may be dressed in All-Black Attire, again another game square, but I can’t tell if those are black pants or dark blue dress pants. The other items I can’t find now are: Book; Menu Typo; Foreigners; Student; Latte Art; Goatee; Political Debate; Pastry Crumbs; and Artiste Glasses. What I can’t wait to find is a friend to play this game with. One day, I hope we’ll be able to play Coffee Shop Bingo together. Missing you here in Michigan.